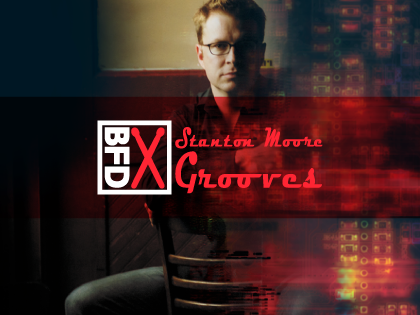 Stanton Moore Grooves is a BFD Groove Pack containing over 300 irresistably funky patterns for your BFD3, BFD Eco and BFD2 sessions. Although it is intended to accompany the BFD Stanton Moore Cymbals pack, it can be used with any kits in your installation. The Grooves feature kick, snare, hihat and cymbal parts dripping with Stanton Moore's classic brand of New Orleans funk. The set comprises 7 Palettes in 4/4 with over 200 Grooves and 100 Fills in total and is perfect for funk, R&B, rock and pop genres. Stanton Moore Grooves is produced by Cymbal Masters.